Sergey Karjakin hit the headlines in 2002 when he became the world’s youngest ever grandmaster aged just 12 years 7 months, a record which shocked the chess world and still stands today. In the first of this new series with ChessBase, IM Lorin D’Costa investigates one of the most famous prodigies of modern times – Sergey Karjakin. 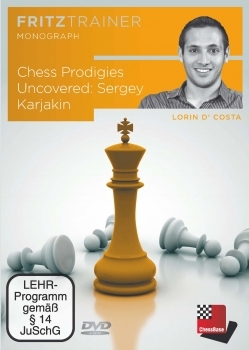 In this DVD, D’Costa focuses mainly on Sergey’s early career from aspiring 9 year old up to grandmaster at 12, culminating in his current world top 10 status, and on who his rivals are for the title of world champion. Not many chess players can say they defeated a grandmaster at age 11, but Sergey did when he defeated Pavel Eljanov in the Ukrainian Team Championships in 2001, and from a level endgame at that! How did Sergey defeat one of the world’s best players, Alexei Shirov, with masterful precision at the age of just 12? How did Sergey grind down the reigning world champion Vladimir Kramnik in 2004 in an opposite coloured bishop ending in the Dortmund playoff aged just 14? Enjoy these and many other scintillating games, along with the new ChessBase interactive format of Question & Answer, to enjoy an interesting documentary about one of the strongest players in modern day chess and his road from young prodigy to grandmaster and beyond! Lorin D’Costa is an International Master from London, England. He is a full time chess teacher and author, coaching some of Englands best young talents. 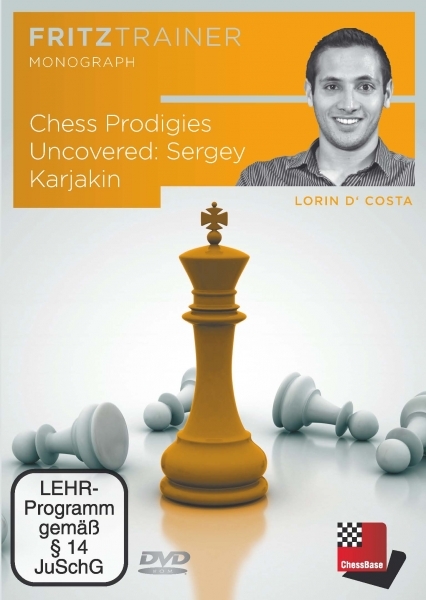 This is his first DVD for ChessBase. Diesen Artikel haben wir am Dienstag, 27. August 2013 in den Shop aufgenommen.